I’m not sure I’ve ever experienced such a glorious autumn as this; London has been bathed in a slanting golden glow for weeks and as even as the temperatures have dropped startlingly these last few days the sky has remained a bright and clean shade of blue. I usually pass through autumn mostly missing summer and dreading winter, with only a kind of grudging acceptance of its beauty. But this year – I’m almost in love with these days and instead of the end of summer it’s autumn I’m now clinging onto! 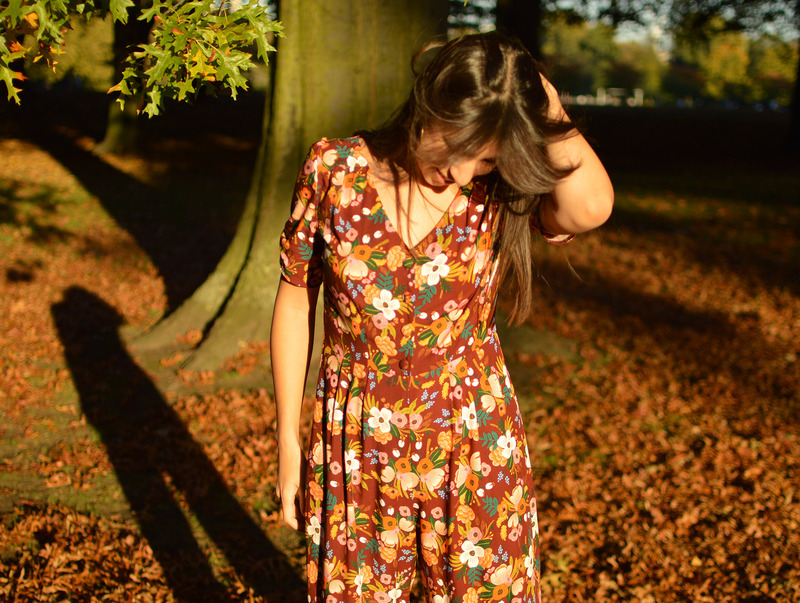 Thus I feel particularly pleased to have made something perfect for this time of year: a jumpsuit with sleeves, enough ease for layering and the most dreamy autumnal print. My new favourite garment is a mash-up of the Kew Dress bodice (version 1) and the Portobello Trousers and it’s worked out even better than I’d imagined! I’ve long been a fan of playsuits but only recently discovered the joys of the jumpsuit (I made a fabulous McCalls jumpsuit this summer and blogged it over on my personal site, Nina Lee Loves) and I’m officially hooked – especially as the Portobellos work so well in this mash-up. It’s actually a really straightforward hack. The Kew bodice has a waist darts on either side of the CF and the CB; I adjusted these marginally to match up with the front pleats and back darts of the Portobello trousers. I had shaved a little off each seam of the Portobellos (a normal adjustment for me as I basically grade between a size 8 waist and a size 10 hip) and measured the distance from the CF to the first pleat, and from the CB to the first dart. 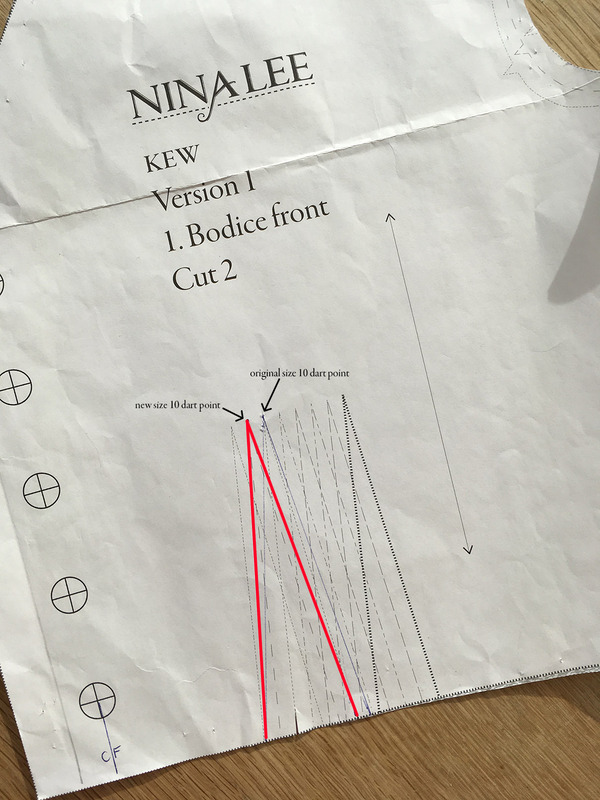 I then marked up the same distances onto the Kew bodice pieces and found that the back matched pretty much perfectly as was, but that the front bodice could actually do with a deeper dart; I increased it by 1cm. Hopefully you can see below how the new dart took shape and how I also moved the dart point left by 0.5cm (which made it sit on the size 8 dart point) to keep the dart legs symmetrical. It’s important of course to bear in mind that the CF of the bodice is where the buttons lie. I also had to add seam allowance down the CB instead of cutting it on the fold to create the space for the zip – I used a concealed 20-inch (50cm). The bonus of the zip means of course no need to create buttonholes! I used self-covered buttons as this Rifle Paper Co fabric was simply too pretty not to. The fabric is Rifle Paper Co rayon from The Crafty Mastermind and for this I used 2.5m. You can see I’ve gone for a slightly cropped length; I like this and it’s definitely on trend at the moment but I also would’ve needed more fabric for a longer trouser. 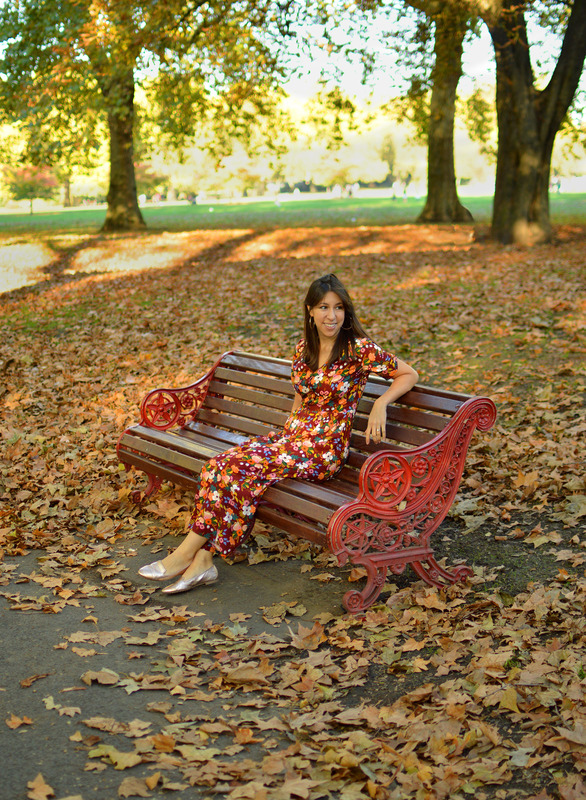 Not only did I enjoy wearing the jumpsuit on a lovely walk in Battersea Park (where these photos were taken) but so far also for a Friday night out; it feels very me and unexpectedly versatile to boot. I love all the colours in the fabric; there are myriad options for coloured camisoles underneath or a slouchy cardigan or blazer over the top, and I can definitely see myself sneakily wearing tights underneath this as things really start to get chilly. What a win! I just don’t know what to call this outfit because Kew-Bello sounds like an unfortunate medical condition whilst Porto-Kew sounds like an over-crowded festival loo! How do you feel about jumpsuits? Have you ever made a mash-up one? What are you sewing this autumn? 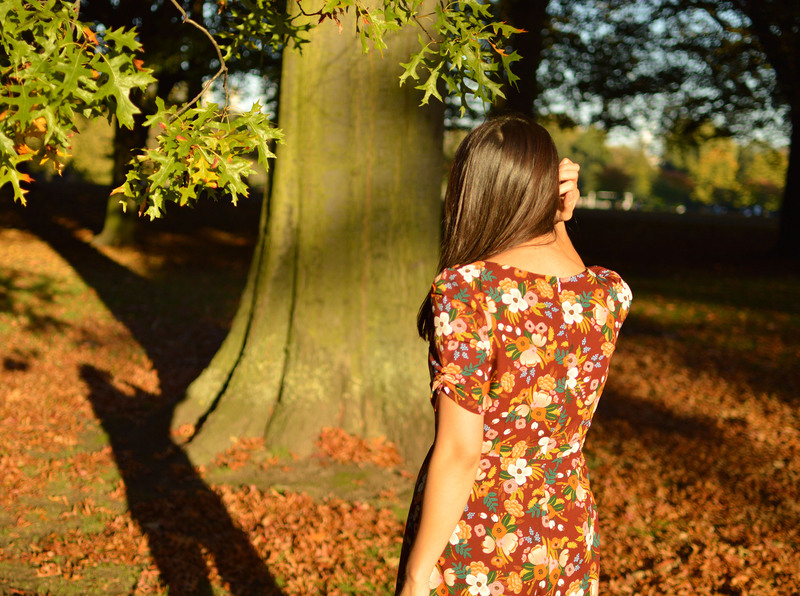 « Kew Dress – ALL the hacks!